Your donations are vital. With your help we can continue to provide our patients with the facilities, treatment and care that can help them beat cancer. Here are some of the ways you can make a donation to the Fund. 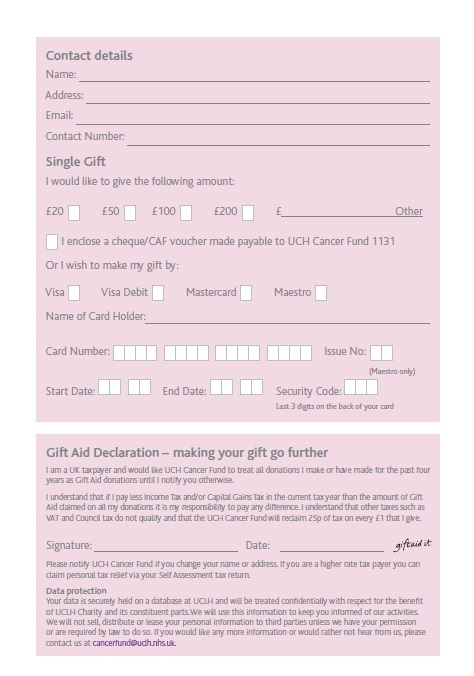 You can send a cheque made payable to "UCH Cancer Fund 1131" and send it with a Donation Gift Aid form (click here to download a form) to: Freepost RTKU-LJHX-LEJH, 4th floor Tower, UCH Cancer Fund, University College Hospital, 235 Euston Road, London, NW1 2BU. Regular monthly or annual payments by standing order help us plan our future projects. We can also reclaim the tax through Gift Aid. To support regularly click here for a copy of the Standing Order form and post the completed form back to us at the address supplied. Payroll Giving or Give As You Earn (GAYE) enables anyone who pays UK income tax to give on a tax free basis. With this method of donating the employer deducts the gift from the employee’s pay (or retired employee’s pension) before tax is calculated, and the donor pays tax only on the balance of their salary. For example, an employee paying 20% tax and pledging £10 a month would notice a deduction from their net pay of only £8 a month, as the remaining £2 comes from tax relief. If you would like to donate this way, you will need to check whether your Payroll Department is set up for GAYE. Then download and complete the GAYE Form and hand it to your Payroll Department. 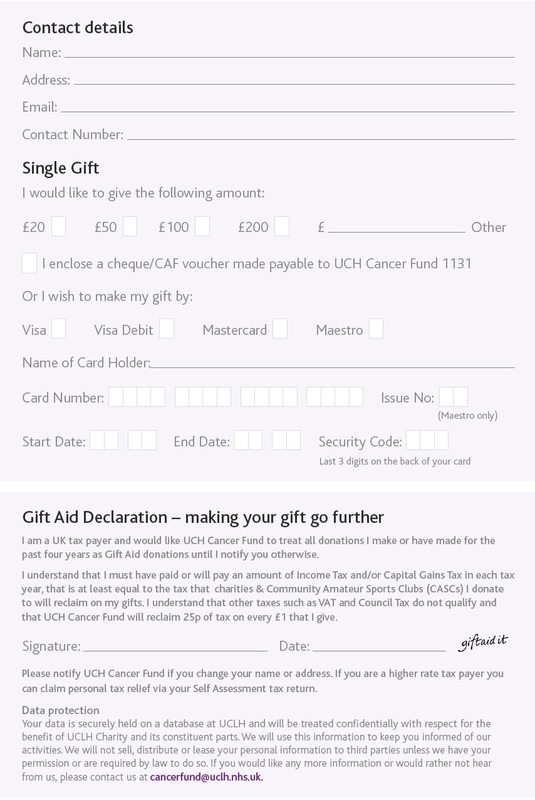 If you are an online shopper, you could raise money for the UCH Cancer Fund at the same time at no extra cost to you at www.easyfundraising.org.uk. 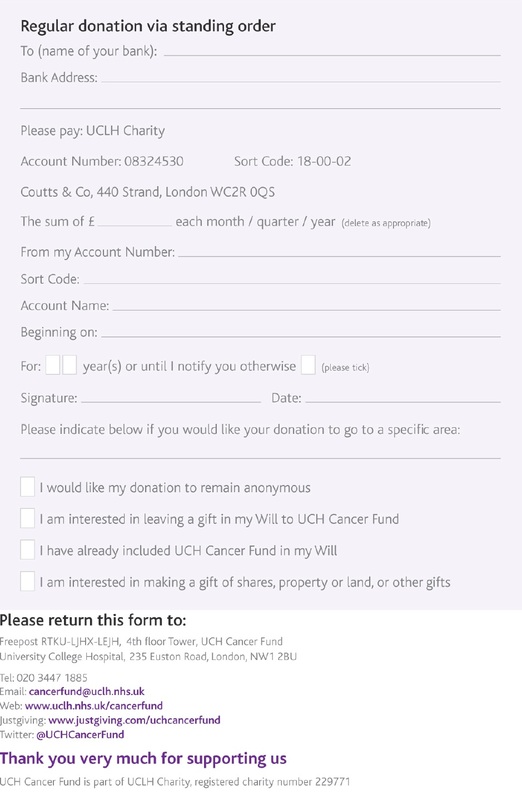 Just type in “UCH Cancer Fund" in the “support your cause” section at the following link - http://www.easyfundraising.org.uk/find-a-cause/. You still shop directly with each retailer but by using this link, each purchase you make will generate a cash back donation to the Fund.